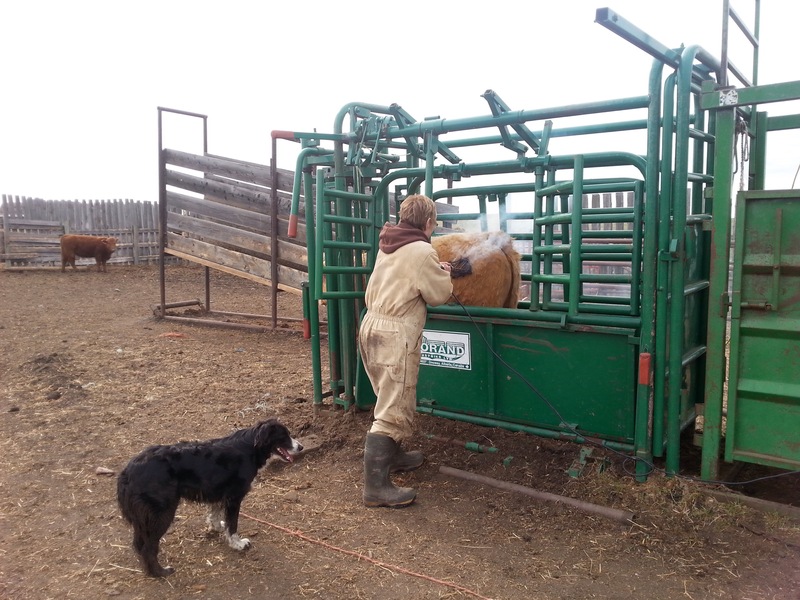 Being more involved with ranching duties means being involved with more of the unpleasant but necessary tasks. Like branding our replacement heifer calves. Hubby caught a shot of me working the brand on my prize tan heifer. I had picked her out as a keeper when first born. I love being able to identify her from the rest of the dark red animals in our herd. She’s one of those “pretty” animals. So I was temporarily concerned about being the one to be applying her permanent mark….but then again….who better than I to be just a wee-bit more on the gentle side. I paid attention to rocking the brand with just enough pressure to evenly distribute the brand and after the few required seconds, I think I did a passable job. I was pleased that she didn’t struggle in the squeeze chute during the procedure. I’ll be less nervous about this part of the ranch chores in the future. Branding is more important than ever now that the value of our animals is so high. This ensures our ownership is intact should we ever suffer loss or theft. We use an electric brand now that moves the process along so much more quickly and efficiently and humanely. In the past, using hot irons for each separate image on our brand…the L, the Z and the bar (-), would have required three separate applications. The “girls” got a real treat after the branding session. They finally got out on grass from the pen they’ve been sharing for months. It’s such a pleasure to see them out on the range where they are meant to be.